Getting bored, waiting for dish? Keeping your customers wait, without making them feel bored or frustrated isn’t that easy. Will a change in dining mat do? 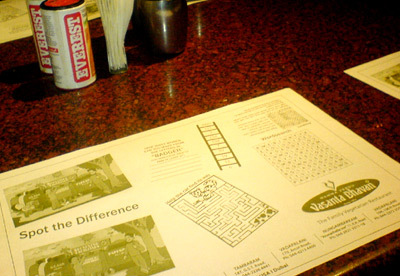 I saw this interesting dining mat in the restaurant, Vasanta Bhavan, Chennai that has puzzles like word search, number series, getting out of the maze and spotting the difference. Nice and simple, isn’t it? Smart idea…but they have to keep changing them regularly, for their regular customers. Yes its a very interesting way to kill time while waiting for your food – especially when you are very hungry. Siva, Kapil – Thanks for your comments.